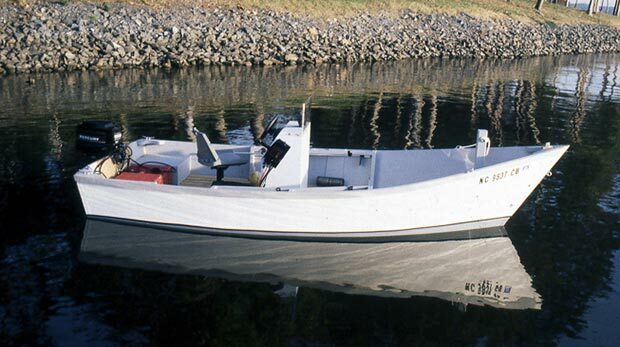 Paul Bennett of Shoestring Shipyard designed this Pilgrim's Pride 16 built by Jimmy Helms of Charlotte, NC. Jimmy writes that it was his first big project and a pleasure to build, going together just as the designer said it would. Jimmy uses his boat as a USCG Auxiliary Patrol Boat on Lake Wylie near Charlotte, NC. He launched her in October of 2000. Jimmy has also built a David Stimpson-designed Sea Urchin, and two Weekend Dinghys designed by Karl Stambaugh. Jimmy can be reached at Wings Unlimited, 6230 Rock Island Road, Charlotte, NC 28278.